There is a story connecting Hanuman with the origin of Navratri. It is mentioned in some puranas. Ravana was an ardent devotee of Shiva and Parvati. Pleased with the devotion, Shiva and Parvati were ever present in Lanka and were protecting the kingdom. When the tyranny of the Ravana became unbearable, Brahma asked Shiva and Parvati to stop protecting Ravana. 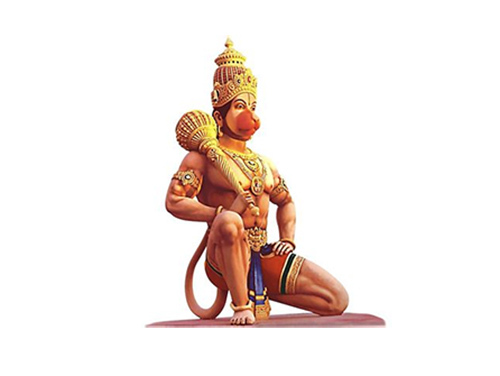 As a solution, Shiva promises Brahma that he will incarnate in the form of Hanuman to help Sri Ram defeat Ravana. Goddess Parvati agreed to leave the kingdom of Ravana when Hanuman arrives on Lanka. To gather information about Mata Sita, Hanuman enters Lanka in a tiny form. On the island, Hanuman comes across the temple of a three-eyed Goddess and eight yoginis. Hanuman is stopped by the Goddess, who is a manifestation of Goddess Parvati. Hanuman immediately shows his true form and Goddess Parvati recognizes Shiva. Hanuman then requests the Goddess to stop protecting the island. As long as She is present on the island, Sri Ram will not be able to defeat Ravana. Before leaving the island, the Goddess ask for a boon that the nine nights of worship should occur in autumn as well as spring. Hanuman agrees to this. From then day onward, Navratri which was originally celebrated only in Chaitra Month became more popular in the Ashwin month. It must be noted here that origin of Navratri festival in Autumn (September - October) is associated with Ramayana. The most widespread belief is that Sri Ram invoked Goddess Durga during the period to get her blessings in the battle against Ravana. Legend has it that Sage Narada asked Bhagavan Sri Ram to invoke Mother Goddess before going into war against Ravana and his powerful demon army. Sri Ram then invoked Mother Goddess Durga and took her blessings. With her blessings, he was successful in his campaign against Ravana. It is believed that he performed the puja and rituals for nine days. There is also another belief that Durga Puja was originally held during spring season or Basant (March - April). It was Lord Ram who changed the nine-day worship period of Goddess Durga from Chaitra (March – April) to Ashwin (September – October). Navratri and Durga Puja in Ashwin month (September – October) is also known as Akal Bodhon, or untimely invocation, as Lord Ram had invoked her during the wrong period.